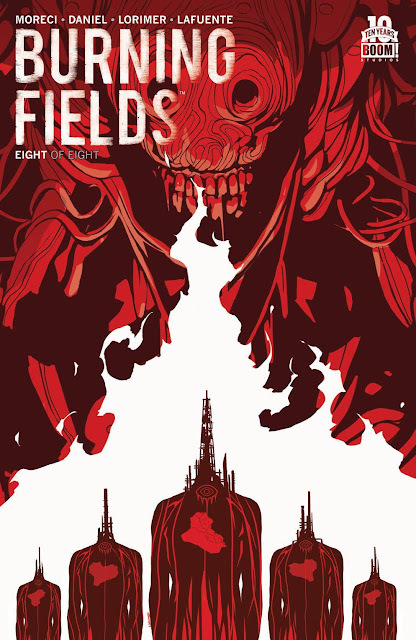 'Burning Fields' #8 is the grand finale of one of 2015's best miniseries. What started as a politically charged military drama evolved into a supernatural police procedural turned monster movie that delivered on every level. The conclusion is bittersweet and perfect. Most striking wasn't the thrills, although they were plenty and they were earned, it was the chemistry and camaraderie between Dana and Aban investigating bizarre murders at an Iraqi oilfield. Dana's tortured soul seeking justice and redemption while an old foe in private military contractor Decker becomes the embodiment of evil personified. Aban is the local detective so earnest and measured he is the counterbalance to Dana's intense and impulsive nature. 'Burning Fields' was the second season of True Detective we didn't get on television. Tim Daniel and Michael Moreci created a riveting character drama as good if not better than some popular programs. It worked because the characters drove the action instead of the other way around. Their interactions felt true and with real weight regarding the situation they found themselves in. The supernatural elements remained as an undercurrent to the real personal conflicts between Dana, her inner demons and the outer forces that spelled doom for them all. If Colin Lorimer and Joana Lafuente weren't superstar artists before 'Fields' they deserve to be now. Lorimer's heavy-lined pencils added dimensions and depth to each panel while capturing the tension expressed in body language and facial expressions. It would be an understatement to say his work got better with every issue culminating in an awe-inspiring finale. Lafuente gave this unique horror story the perfect dark and moody atmosphere with stark color choices that set the tone perfectly. Dana, Aban, Decker and the summoned monster of Asag face off in an anxiety-ridden third act that delivers on what was built over seven issues. The ending is a satisfying, poignant and compelling climax that transcends genres and raises the bar on modern comic book storytelling.